Google Sky Map for Android: Good Heavens! Finding and identifying heavenly bodies with Google Sky Map for Android smartphones, such as the Motorola Droid X on Verizon Wireless, is fun as well as enlightening. However, this astronomical application requires a learning curve. Like many powerful gadgets, this one can lie to you convincingly. You need to have your own sense of place and pay close attention to details. You aren't going to ride this maverick without occasionally biting the stardust. It sure ain't Kansas, Toto. Point your Droid X smartphone anywhere day or night for a 4.3-inch high-definition, color touch screen full of planets, stars, constellations and even Messier objects. Orient yourself with horizon line and grid lines (the latter are right ascension and declination, like longitude and latitude projected onto the celestial sphere). Choose Automatic (moving display via GPS) or Manual (fixed display), as well as zoom. 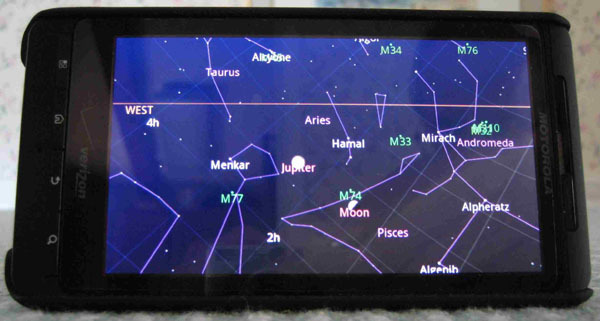 Sky Map presents its clear display regardless of the local weather. In cities and suburbs, we are no longer blind to a night sky awash with haze and ambient light. Still, it is hard to wrap the mind around the universe on a little flat screen. Supposedly more than 1,000 stars are shown, but who's counting? Although identifying sky objects outdoors is compelling, sky study is more comfortable indoors swiveling around in a rocker recliner. Think Star Trek, where the crew doesn't have to ride outside the Enterprise to see stars. Point an Android phone with Sky Map at the floor and see not just the South Pole at an angle, but what is around the Nadir directly beneath our feet. Tilt the Android phone at the ceiling and see not only the North Pole at an angle, but celestial objects at the Zenith directly above us. Android is an open source platform for smartphones and tablets. For smartphones running Android 1.6 or higher, Google Sky Map is a free download from Android Market. Go on line, touch the Market icon, search for Sky Map, download it and within minutes you are exploring the sky. The key is the way the Droid X smartphone can be raised and lowered, tilted, or rotated in any direction. Try doing that with a conventional computer. The Droid X sense of freedom and control is like waving a magic wand. In Auto mode, we finally get a better sense of living on a sphere hurtling through space at about 67,000 mph. The display comes alive not through any camera or lens but through Global Positioning System (GPS) updates. Sky Map synchronizes with clock, compass and GPS to show not just the sky where we are located, but the sky everywhere around the Earth. In effect we are able to see through the Earth. Park the Droid X on a table and the display moves slowly to the right as the Earth rotates to the left, counter-clockwise in its 23.5-degree inclined orbit. If the planet Mars is just touching the right edge of the Droid screen, in a minute or two its letter "s" will vanish. The four-letter word "Mars" will disappear entirely in about the time we take to finish a cup of trendy beverage. Google Sky Map also lets us find a heavenly object by typing its name and then playing Hot and Cold. An arrow on a large circle changes from blue to red, then to orange. A flashing yellow smaller circle pinpoints what we are looking for. We can freeze the sky with Manual mode, but that is like visiting a museum instead of a seashore. The six-layer display is impressive, but to find specific targets, e.g., planets, sometimes you might want to turn off other layers, then add them back one at a time as you adapt to how much data you prefer to see. Time travel lets us see how the sky looked on any date from 1900 and will look up to 2100, e.g., the Apollo 11 moon landing or the next full moon. Selections are limited because of accuracy limitations “caused mainly by the gravitational influence of Jupiter.” (You had to ask.) Hubble Gallery shows spectaculars like the Crab Nebula, which then can be located with Find In Sky. Night mode, with red lettering on the screen, preserves night vision. In Night mode the phone's four white control buttons at the bottom of the screen are supposed to dim. However, they often stay bright, necessitating tape or finger cover. For a quick outside start validation, zero in on good ol' Vega, our North Star emeritus, which someday will reign again. Sky Map requires a good GPS connection, calibrating the compass on your smartphone (more complicated than you think) and considerate (as well as considerable) handling. If in Auto mode you whip the program around like a toy, don't be surprised if the Sun stays in the same place on the screen, or East shows as West. Take it slow and use common sense to peruse the sky and its objects. Apparently this reflects normal GPS signal lag, however brief. Sky Map seems to be more credible held horizontally than vertically. Compass calibration can take 10 minutes or more of rotating the smartphone in its three axes; think somersault, twist and cartwheel. On the Motorola Droid X, the path is Settings, Location and Settings, Compass and Calibrate Compass. A helpful animation demonstrates the three motions with a phone that has a green tinge. Don't mistake the green tinged phone for the green compass you seek. You have to repeat all three motions until finally the animation is replaced with a colorless compass circle and arrow that finally turns bright green. Only then is the compass calibrated. With GPS constant tracking, Sky Map uses a lot of battery, around 25 percent. So don't leave it on beyond what you need to locate, unless you are near an electrical outlet for your charger. Be sure GPS is turned on or you may get misleading readings. Go to Sky Map Settings, Location Settings, Always Use GPS, Use Magnetic Correction. Afterward, when you finish using Sky Map, remember to go to Droid Settings and turn off GPS. Battery life normally is about eight hours of continuous use, more on standby or with light use. Recharging is quick and easy, with a clever cord that doubles as a USB link to computer. Multitasking is wonderfully convenient, but use Advanced Task Killer often to turn off unneeded applications running in the background. All wireless phones have area gaps somewhere, so be sure to check the provider's coverage map to ensure your location is served, as well as where you travel. Many navigation applications use some form of prefetching, i.e., installing total route maps in memory in event of signal loss. Explore this further if you plan on using Sky Map far afield. Although standalone devices may be more powerful, smartphone applications can complement or replace many of them. Whatever application you need probably is available in some form from the Android Market. Many applications are free and few cost more than a couple of dollars. Some applications, such as navigator, allow voice commands. Once a smartphone becomes your mobile phone, camera, trip navigator, electronic book reader, e-mail reader, movie theater, star gazer and Internet searcher, it is the last thing you check at night and the first thing you check in the morning. All this on a palm-size Droid that fits comfortably in pocket or purse. Even when charging overnight, or sometimes during the day, my Droid X is always on, except when refreshed with a reboot, which is recommended daily. Any performance compromises? Mostly, no separate large keyboard. When needed, a touch keyboard appears over the bottom third of the touch screen. The touch screen keyboard is doable, but slowly and carefully, one finger at a time. Four buttons beneath the touch screen offer management, home, return and magnify. For major production, the smartphone obviously does not replace a desktop computer with its large screen and full size keyboard. However, for all-around constant use, the smartphone has eclipsed our laptop and notebook computers. Accessories most helpful to Google Sky Map and all functions are a screen protector, a vinyl case or Shell/Holster Combo with Kickstand ($30 from Verizon Wireless) and a vehicle power charger (about $30). The smartphone scene is dynamic. Expect jazzier phones every year, but your present smartphone should do fine for several years, if you are not compelled to be on the cutting edge. Check your local wireless phone providers to see which Droid smartphones are offered. For example, in my area, Google Sky Map will run on Verizon Wireless Droid smartphones by Motorola (Droid X2), HTC (Droid Incredible 2) and Samsung (Droid Charge). In addition to your regular wireless telephone monthly cost, prepare to pay about $200 for a Droid smartphone plus $40 or more a month additional smartphone usage on a two-year plan. Pricey, but a bargain for a pocket brain enhancing not only connections but perspective and quality of life. An old saying contends they who gaze at stars are at the mercy of puddles on the road. Put on your boots, because Skymap for Android is a stellar reorientation to heavenly destiny. Copyright 2011, 2016 by Mark Wynn and/or chuckhawks.com. All rights reserved.